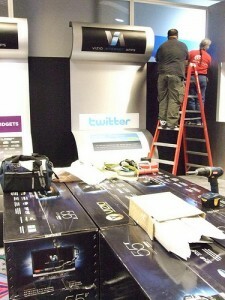 CES 2010 – Twitter Anyone? One of the big stories here at CES is the rise of Twitter as a (the?) key tool for *companies* to connect to *consumers* as well as the bloggers and industry insiders that flock to Las Vegas every January for the CES show. This picture is from Wed setup when thousands of technicians set up thousands of exhibit booths here at the Venetian Sands. Engadget, the official blog for the conference, has some really neat stations set up that show the twitter feed – I think only things tagged with CES related hashtags. UPDATE: Sorry….I’m not clear on what these stations are showing as it does not appear to be Twitter. Still, Twitter has mainstreamed so fast – it was the missing application that allows fast and effective communication person to person or person to large group. I’ll be doing a longer feature on this with more pictures later in the conference over at the CES Blog. 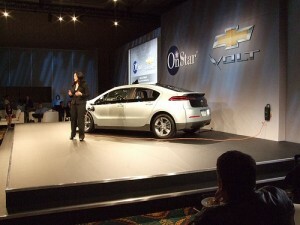 Correction: In earlier post I was wrongly crediting Ford for the clever Onstar / Chevy Volt Mobile Innovations and of course they are from GM not Ford. UPDATE: Unlike in past years, the CES Conference is NOT using the Sands Convention Center for the big floor exhibitors so unless you have specific vendors to visit at the Venetian or Sands you’ll probably want to focus your efforts on the Las Vegas Convention Center. Bloggers and Press note that the Venetian facilities this year are limited to a small lounge, so you should probably plan on using the LVCC Press Room and Blogger lounges more than the Venetian. Adding to both the fun and the challenge of the massive CES show is that it is … really … big. This is an excellent map from CES Web: CES_Show_Map (pdf). The many different maps they have at the show are – for me – kind of hard to work with unless I have a very specific vendor to find. I’d recommend that first timers print out This map and review it before arriving. Targeting plus aimless wandering = success! With some 2500 exhibitors I’d recommend you concentrate on finding things that really interest you and dig in deeper at those exhibits, and then simply walk the show floors somewhat systematically to take it all in. Because of the wait times and 10 minutes of travel I’d avoid taking the shuttle back and forth from the Venetian to the Convention Center – rather pick different days to visit each, perhaps lining up the Venetian or Hilton venues with parties or other events you have there since the Convention Center pretty much closes down after about 5 or 6 pm though many people and some exhibitors will linger on. UPDATE: Unlike in past years, CES is NOT using the Sands Convention Center for the big floor exhibitors so unless you have specific vendors to visit at the Venetian you’ll probably want to focus your efforts on the Las Vegas Convention Center. Bloggers and Press note that the Venetian facilities this year are limited to a small lounge, so you should probably plan on using the LVCC Press Room and Blogger lounges more than the Venetian. 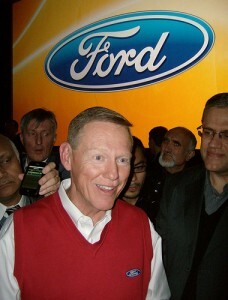 Ford’s Allan Mulally- the best/last auto man standing? Ford CEO Allan Mulally will again keynote this year’s CES. Last year Mulally’s keynote was exceptional both in content and innovation as well as how passionately Mulally seemed to feel about Ford’s prospects in the very troubled times of the auto industry. With a background in Aerospace Engineering, Mulally seemed the right man at the right time to face the difficult challenges ahead for Ford. After the talk I had a chance to ask him if Ford would need auto industry bailout money and he said “no”. Although Ford has enjoyed some loans from the US Energy Department I do not believe they’ve requested bailout funding, and it really appears that under Mulally’s leadership Ford will emerge successfully and eventually profitably from the near collapse of the US Auto industry. 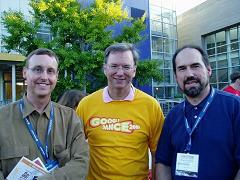 Photo by Technology Report – OK to use with attribution. The Las Vegas Hilton Venue for CES is located adjacent to the Las Vegas Convention Center – which still means a walk of about 5-10 minutes but does not require you to take the free and frequent shuttle bus as you must to go from the Convention Center or the Hilton to the Venetian / Sands complex which is a few miles away. The Hilton is the smallest and most easily manageable of the three major CES Venues which also include the Venetian / Sands and the Las Vegas Convention Center. In Las Vegas you’ll want to preserve your strength and take shuttles whenever possible because simply walking from one hotel to another along the strip can take some time in this city of mega-buildings. Also note that with buildings of this size your mind (and even maps) may tend to fool you into thinking things are closer than they actually are. Although the CES Conference pretty much takes up all of the Las Vegas Strip for several days, there are three key venues for the conference. The largest is the Las Vegas Convention Center, a massive and sprawling complex with “North Hall” , “South Hall”, and “Central Hall”. This is where most of the exhibits are located. The second venue is the Las Vegas Hilton which is next door to North Hall, though among the mega-buildings of Las Vegas “next door” often means a shuttle ride or walk of 10+ minutes. The other major venue is the Venetian Hotel / Sands Convention Center, another huge and interconnected complex featuring several large convention halls and hundreds of hotel suites to feature specialized audio and other innovations.